Gary Pellicci salon joined the Gold Class family a few months back and Inanch went in to train the team back in July 2017. 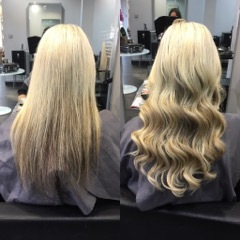 Whilst they had worked with extensions a few years ago, they wanted to offer their clients something different and re-train their team to offer the best hair extension service to their clients. We caught up with their team to find out more about the beautiful Grade2 listed salon, the extensionists, and their style. Tell us about your typical hair extension client? Our typical hair extension client is looking for a little more length but mainly thickness. We have varied ages, the younger clients tend to want the length and thickness and the more mature client generally wants more body and thickness to their hair. Having a few strands placed either side of the head has been popular for a little more thickness and makes a huge difference to the client in terms of style options and confidence. Which celeb is the most requested hair icon your clients want to emulate? In the main, we are asked for Nicole Scherzinger, Cheryl Cole or Jennifer Lopez, who all have long glamorous locks. The client wanted a little bit of length but mainly thickness; choosing two-colours, 17 & 14 to mixed together in halves with quarters to blend with the client’s hair and create a more natural look. Altogether we only used 100 strands in 40cm length. Once the hair extensions were applied and then cut to blend and finish the style, the hair was curled with a wand in medium-sized sections before we gently brushed them out using the Gold Class brush to form a soft wave. What hair care tip you share with your extension clients for better maintenance. For maintenance, I advised my client to use the Gold Class Shampoo and Conditioner or the Philip Kingsley no scent no colour shampoo and conditioner. They are both Sulphate-free which is a must for hair extensions. I also advised my client to use the Gold Class hairbrush to prevent the bonds from getting tangled and to use when the hair is dry. Good maintenance is key as it keeps the hair silky smooth and the hair bonds separated. Tell us about the style of your salon, your team, and your ethos. 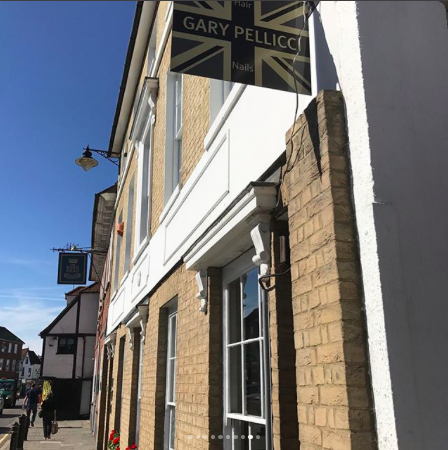 Gary Pellicci offers their clients a professional but friendly atmosphere within a beautiful Grade 2 listed building in the heart of Ongar. The interior is spacious, elegant and understated with a passionate team who strive to offer each client the very best in client care and technical skills. What made you want to work with Gold Class Hair? We wanted to work with Gold Class hair as we had been interested in training in hair extensions for a long time. There are many brands available but Gold Class hair stood out from the rest with its exceptional quality. I also like its exclusivity and the natural look you can achieve from mixing the colours which offers clients a bespoke service. Tell us a little bit about yourself. What do you like doing on your day off? Who inspires you? Which celeb do you want to do their hair? Louise Gergiou: I have been in the hairdressing industry for 12 years and qualified for 10 years. I have always wanted to be a hairdresser from a young age. I love what I do as you get a lot of job satisfaction from making people feel happy and good about themselves. In my free time I enjoy socialising, spending time with my family and friends. I enjoy eating out and trying new places in London. The celebs hair who I would like to do the most is Nicole Scherzinger as she always has long luscious locks! Inanch Emir inspires me on how successful her business is. Inanch trained at Enfield College where I also trained and it’s amazing to see how far she has come. I was lucky enough to spend the day with Inanch at her salon for training which was great to watch her work and I hope, eventually with lots of practice I become that good and quick at Gold Class extensions! Chelsea Killick: I have been qualified in hairdressing for 4 years. In my spare time, I like to make the most of my time with my 3-year old daughter. I originally trained in London and I am inspired by the hairdresser, Despina Siamou. I would love to do Kate Middleton’s hair. If we are to visit you guys, tell us the best spots to visit your town? Good places to eat in our town are Smiths Brasserie, Turkwise, and the Kings Head. Hope to see you soon.